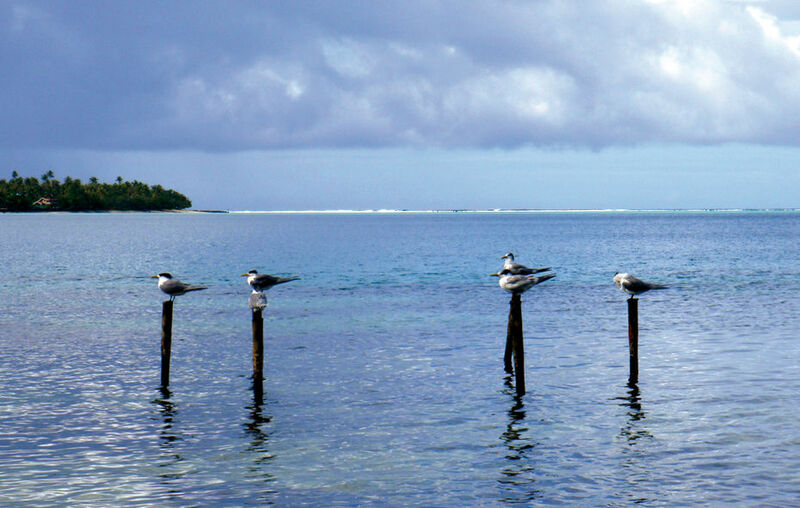 The anchorages at Huahine are all superb… A must during a round the world trip! At the heart of the Pacific Ocean, the Society Islands offer sailors heading west a temporary return to the workings of French life overseas. In this regard, French Polynesia and the five archipelagoes of which it is comprised (the Gambier Islands, the Marquesas, the Tuamotus, the Austral Islands and the Society Islands) - each group very different from the other - remain a must on the round-the-world route. One thing is for sure: if you are used to sailing in the Atlantic, the real voyage begins in the Pacific… Here we continue to follow Olivier and his family’s cruise aboard Jaganda. “We set off from Opunohu Bay at sunset, bound for Huahine… It was still nice, with the wind blowing easterly force 3 to 4. As soon as we had cleared the pass, the swell was pushing us towards the west. Without being able to offer any proper explanation, at half a mile outside the pass and in several hundred meters of water, a single steep wave, several meters high, broke over Jaganda. Olivier just had time to warn us as he leapt to the helm. Our catamaran lifted way up on the port hull and suddenly we found ourselves horizontal. Hundreds of liters of water flowed across the deck, flooding the cockpit and coming into the salon. The rice-cooker made a sideways leap, but came back down in its spot. Dinner was saved! Later Olivier would tell us that evening on board Jaganda that we had experienced the biggest list of the whole trip! He confided in me afterwards that he was seriously concerned ahead of the very steep face of that wave which appeared out of nowhere. In the early hours of June 29th, after a rough night at sea, we entered Huahine’s lagoon via the Avamoa Pass. We anchored off Faré, the island’s main village. I am particularly attached to Huahine. I’ve been lucky enough to stop here three times already, one of which was with the Taporo, the local supply ship which serves the islands, and carries passengers. Huahine is an island apart, different from her sisters: she has not been subjected to the same touristic developments, and so her originality remains intact. In 20 years I cannot see any major changes, and I’m glad of that. Huahine is comprised of two islands, linked by a narrow isthmus, enclosed within the same lagoon. The landscape is gentler than that of her neighbors, and her heavily indented coastline provides numerous anchorages. We make the most of being in Faré to revictual at a well-stocked Chinese store. There you can find everything: fresh goods, frozen, fruit, vegetables and “pai-bananes”, a stuffed pastry with banana jelly, which we all love on board.